Since fall has arrived and cooler weather is on the way, now is the time to pick up a few tips that will keep you catching fish even on challenging days following a cold front. In other words, don’t keep your fishing boat at the dock just because the pressure is high and the skies are clear — you have to be a bit more patient and resourceful to experience success. Consider the following five tips when bass fishing after a recent cold front. 1. Slow down your presentations. Bass tend to be in energy conservation mode after a cold front blows through. They are much less likely to chase down a fast-moving lure or bait. When fishing after consecutive cold fronts, this is even more important to consider because fish will become less and less active with each passing front. Leave the crankbaits in your tackle box. Try soft plastic creature baits, suspending jerk baits, or hair jigs instead. 2. Use smaller lures. Bass can become lethargic after a front passes through, so use smaller lures that will coax them into biting. Small lures or baits require less energy for fish to pursue and strike. For example, use a 3 or 4-inch plastic worm or small tube jig instead of a 6 or 7-inch plastic worm or large profile spinnerbait. 3. Look for heavy vegetation. On clear days when skies are bright blue, sunlight often sends bass into the shade of heavy cover. Use a weedless Carolina or Texas-rigged plastic worm in areas of thick vegetation. Cast your line out, let the worm settle on the bottom, and then slowly lift it a few inches off of the bottom and let it settle again. 4. Look for deeper water. Remember that water temperatures will be more stable in deeper water. This will send bass from the shallows out toward deep-water ledges, humps, channel swings, or secondary points. This is the time to utilize your electronics and locate these temperatures changes. 5. Give it 15 to 20, then move. 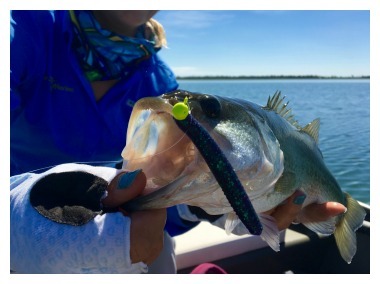 If your regular spots don’t produce a bite after 15 to 20 minutes, don’t stick to that spot. Move on to another area. When you do find an area where bass are actively feeding, pay close attention to any structure or bottom composition that may give you clues as to why.